Cuba is less than a hundred miles south of Florida, but decades of travel restrictions made it largely inaccessible to United States citizens. 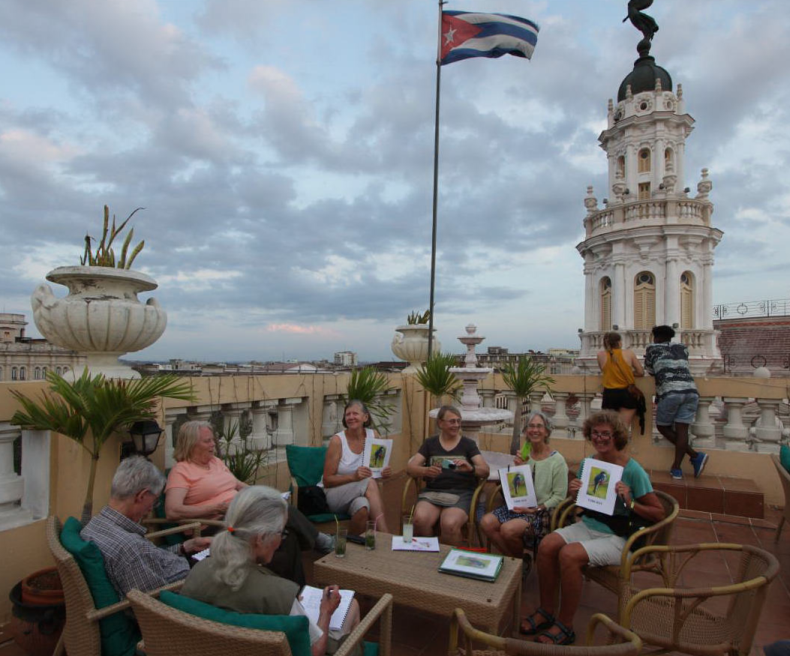 Fortunately travel restrictions have loosened, and in April 2016, the Carolina Bird Club sponsored an educational and people to people tour of Cuba. We visited several special conservation areas, met local birders, and saw all of the 25 possible Cuban endemic birds — and all the 25 possible West Indies endemics. By all measures, it was a tremendously successful trip to an interesting country with friendly people, a history and culture intertwined with the US, and some very special birds. Our group arrived in Miami on April 15, the day before our early morning charter flight to Havana. The group was comprised of CBC members Martha Cutler, Judi Durr, Katherine Higgins, Sarah Goodnight, Marcia Lyons, Helmut and Nancy Mueller, Clyde Smith, Audrey Whitlock, and leader Derb Carter. After a short 45 minute flight on the morning of April 16 and arrival at the Havana airport, we were met by Roxana who had flawlessly helped with lodging and other arrangements in Cuba. She introduced us to Raul, the driver of our small bus for the duration of the trip. 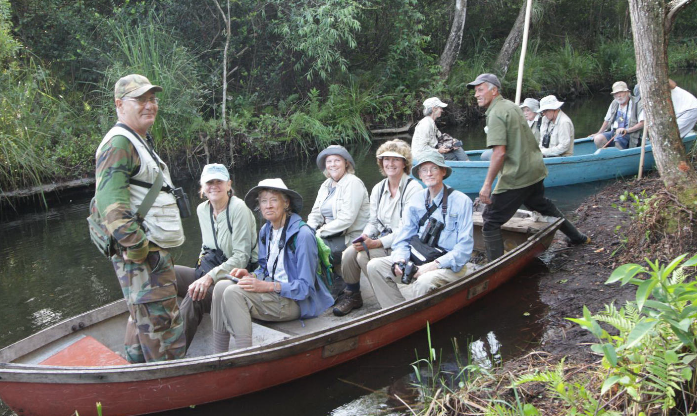 This was Raul's first birding group, and while he was a bit apprehensive initially, I think he came to really enjoy a group of Americans interested in birds and visiting places off the beaten tourist routes, insisting at the end of the trip we contact him if we return for another tour. His humor and good nature was a pleasure throughout the trip. Just over an hour after departing the Havana airport, we made our first birding stop at a roadside campground Campismo la Cherrera. 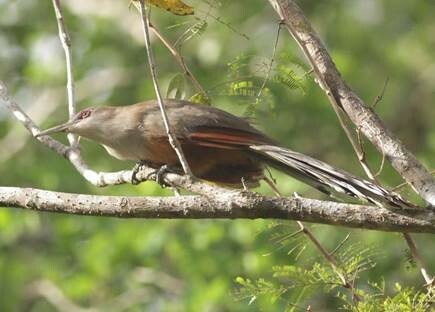 I had some information on recent sightings of Cuban Grassquits at this location, and within five minutes we were looking at a pair in the trees and feeding on the ground. It turned out to be the only ones we saw the entire trip. 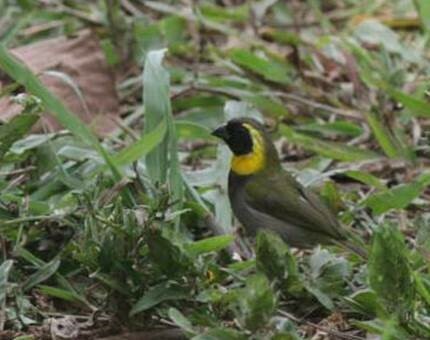 The colorful male is a popular cage bird in Cuba, and keeping songbirds in cages is widespread in Cuba, and the grassquit has become scarce and local. This site proved to be quite birdy, and we added other more widespread Cuban endemics including Cuban Pygmy-Owl, Cuban Emerald, Cuban Trogon (Cuba's national bird), Cuban Tody, Cuban Green Woodpecker, Cuban Pewee, Cuban Blackbird, and Cuban Oriole (nine “Cuban somethings” at our first stop!). 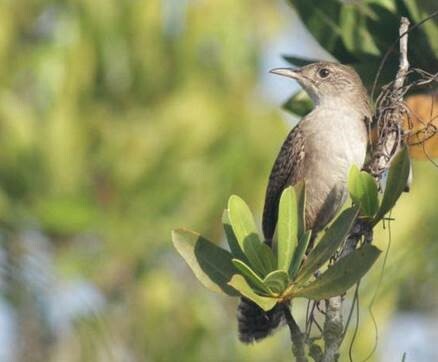 We also added West Indian endemics Zenaida Dove, West Indian Woodpecker, Loggerhead Kingbird, Red-legged Thrush, Tawny-shouldered Blackbird, and Greater Antillean Grackle. 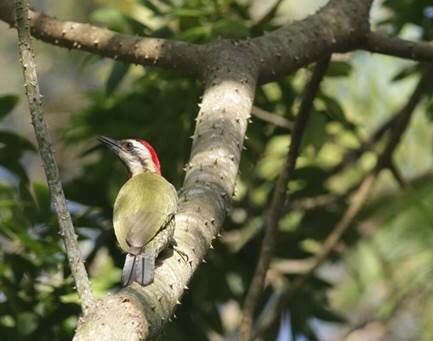 Black-whiskered Vireos were calling everywhere — previewing its status as the most ubiquitous songbird in Cuba — and we also added the widespread Yellow-faced Grassquit and Gray Kingbird. We drove on another hour west to San Diego de los Banos, a small town nestled at the base of the mountains of Parque Nacional La Guira, and our comfortable Hotel Mirador, where we would spend the first two nights. 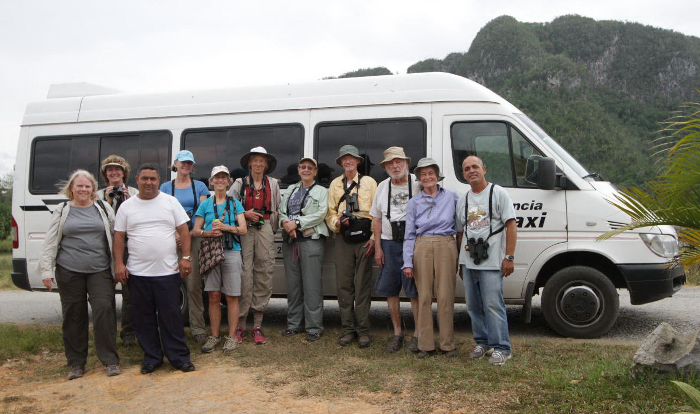 After an early breakfast on April 17, we met local birder and guide Cesar and loaded on the bus for a thirty minute drive to Hacienda Cortina and the entrance to Las Cuevas de los Portales. 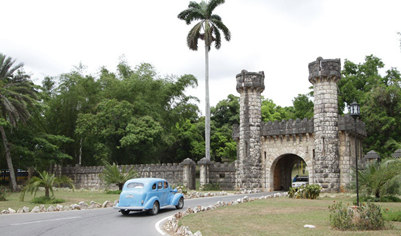 Hacienda Cortina was a summer home and park playground for a wealthy Havana lawyer and politician. 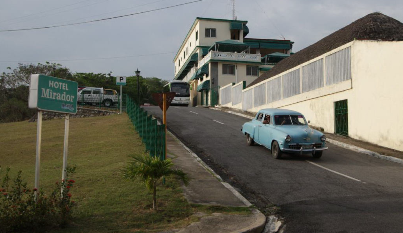 During the Cuban revolution, the numerous caves in the limestone hills were a hideout for Che Guevarra, and after the revolution the lands were confiscated by the Castro government and dedicated as a national monument. As soon as we exited the bus, we heard the flute-like whistled song of our main quarry — the Cuban Solitaire — floating down the hillsides. We followed a stream into the hills, eventually walking through large limestone caves carved by the stream. A labyrinth of caves cut through the hills, and in one Che's desk, a large flat rock, and small wood framed bed during the Revolution were identified with simple signs. 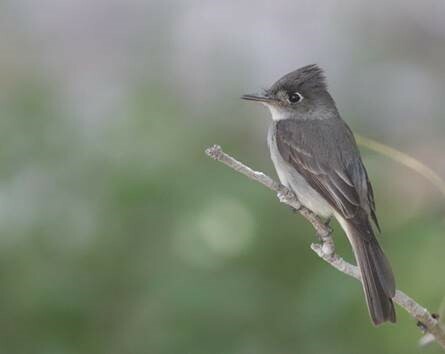 We soon arrived at a spot with a good view of the damp deciduous forest, and after a short wait a Cuban Solitaire appeared and sang stationary from a perch for all to see and photograph. Pigeons were flying over and occasionally perching, and turned out to be both White-crowned and Scaly-naped. 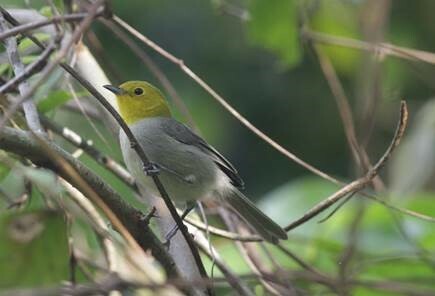 Several Yellow-headed Warblers were calling and flitting in the shrubs along the trail. 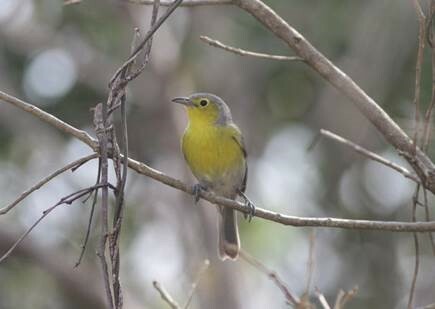 Yellow-headed Warbler and its eastern Cuba counterpart Oriente Warbler, the only members of the Cuban endemic genus Teretistris, are likely not warblers at all, but an endemic Cuban bird family. Several taxonomists have now moved the two species to the unsettled “Incertae sedis” (family uncertain) classification. On our way back to Hotel Mirador for lunch, we stopped on a ridge top high enough for pine forests. 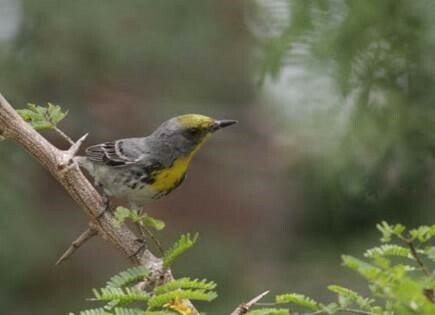 In short order we had a pair of Olive-capped Warblers calling from the pines. 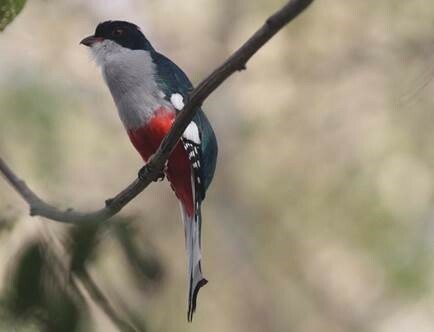 This species is only found in pine forests of Cuba and three Bahama islands. 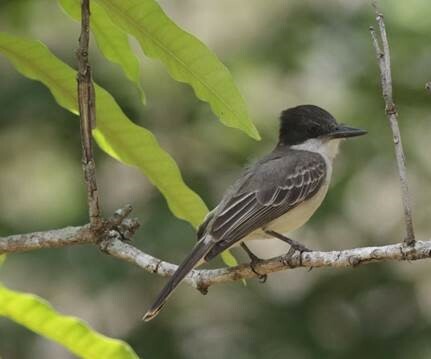 After lunch, we returned to Hacienda Cortina and Cesar took us on a short walk to a nest of Giant Kingbird, a scarce and local Cuban endemic. While waiting out a downpour on the porch of a park building, Sarah picked out a roosting Antillean Nighthawk sitting motionless on a limb in the rain. After the rain stopped, we walked down the trail to the nest, where one Giant Kingbird was incubating while another perched near the nest. On April 18, We departed San Diego de los Banos after breakfast and headed back toward Havana and then southeast to the southern coast and our next destination: Zapata Swamp. Cesar recommended we stop enroute at a reservoir for waterbirds. Raul knew the location and we pulled into a small rest area overlooking the reservoir. After some scanning, we found Lesser Scaup, Ruddy Duck, Masked Duck, Pied-billed Grebe, Least Grebe, Neotropical Cormorant, and several species of herons and egrets. After another couple of hours of driving, we entered the small village of Palpite. 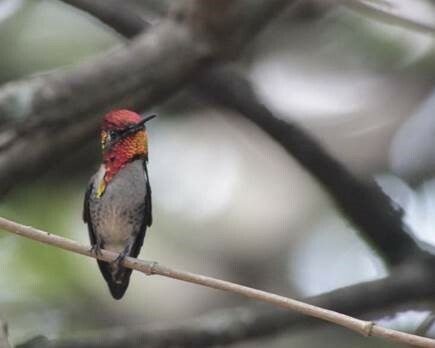 I had some information that a family in the village had planted flowering shrubs to attract one of Cuba's most special birds, the Bee Hummingbird, which has the distinction of being the smallest bird in the world. As we entered the village, Raul pulled over and asked for directions to casa de Bernabe. The friendly villager smiled and held his fingers about an inch apart and said “ah, zunzuncito,” the Cuban name for Bee Hummingbird, and gave us direction. On the back side of the village, we pulled up to the house and were met by Senor Bernabe, who invited us into the backyard for one of the most enjoyable two hours of the trip. At least four Bee Hummingbirds, with about ten Cuban Emeralds, buzzed around a large yellow flowering shrub. The flowers and homemade hummingbird feeders crafted from beer bottles attracted not only the two hummingbirds, but also Cuban Orioles, Tawny-shouldered and Cuban Blackbirds, and Western Spindalis. Senora Bernabe would dip a flower in sugar water and hold it while a tiny Bee Hummingbird fed at her fingertips. They were very proud of their birds and it was hard to pull ourselves away. We arrived late afternoon in Playa Larga, on Bahia de Cochinos or Bay of Pigs, site of the botched US invasion of Cuba after the Revolution. We checked in to Hostal Enrique for a three night stay. 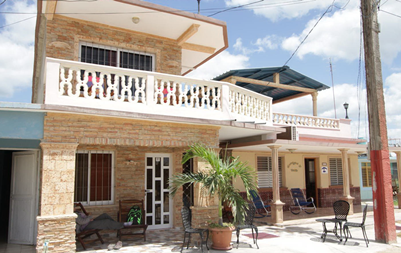 The hostal is what is known in Cuba as a casa particular, and privately owned house that rents rooms and serves meals, a Cuban version of bed and breakfast. Emerging capitalism in the communist country. Our host family was very accommodating, and we were served the best Cuban meals of the entire trip. Playa Larga sits next to Parque Nacionale de Zapata, the world famous Zapata Swamp and largest wetland in the Caribbean. The Everglades like marshes cover extend for miles, bordered by stands of palms, mangroves, and deciduous forests. Early the next morning April 19, we were met by Angel who along with his brother is an expert on Zapata swamp and its birds. We drove a short distance to Soplilar, set in a particularly nice forests with wide trails. After hearing and fleeting glimpse of a flying bird, we had point blank looks at our main target, the endemic Gray-fronted Quail-Dove. 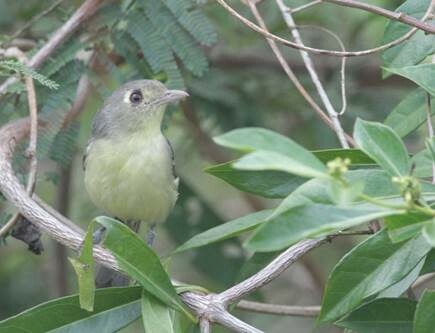 We picked up our first Cuban Vireo, and Cuban Trogons and Cuban Todies were common in the forest. 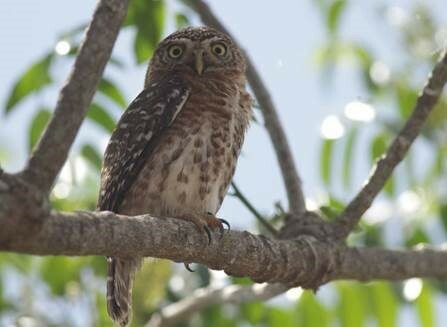 After checking several possible roost trees, a tap by Angel on a palm revealed a Bare-legged Owl peering out of a cavity. Late morning we drove south on the beach road to Cuevas the los Peces, a small limestone pond a short distance from and connected to the blue Caribbean waters by an underground water-filled cave. Divers were swimming back and forth through the cave. Everywhere you looked, the ground was moving as large red land crabs walked sideways across the sandy soils. 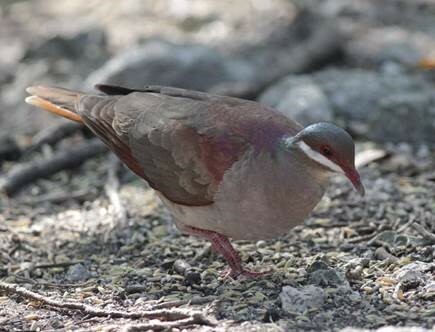 Within a few minutes, a Blue-headed Quail-Dove appeared at the edge of some scrub, then another, and another. 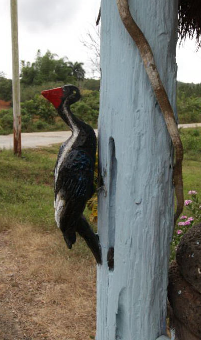 This is the most reliable place in Cuba to see this usually secretive bird of the forest floor. 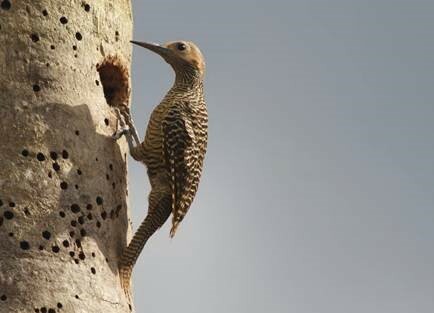 In the afternoon, a hike through an open palm grove took us to a nesting cavity and pair of the striking and endemic Fernandina's Flicker. 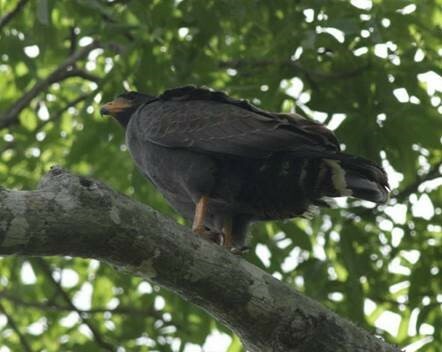 April 19 was the day for Zapata Swamp's most special birds. After an early departure, we drove into the heart of the park and its vast marshes to the small village of Santo Tomas, where Angel was born and raised. We were met by two men, walked a short distance, and loaded into two small boats. The men poled the boats down a narrow canal into the marsh. After a bit less than a mile, we unloaded and walked short distance into a small cleared area. 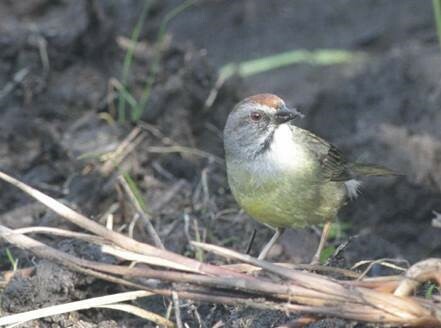 After some anxious waiting, a Zapata Wren appeared, a large, long-tailed wren found only in the marshes of Zapata Swamp. 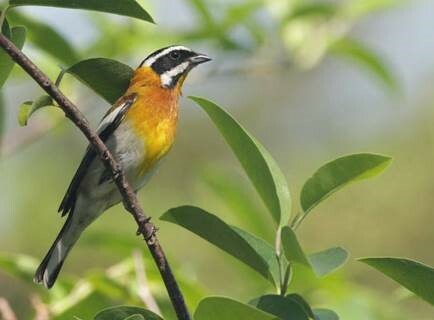 It is not only very local, but secretive, and the Cuban endemic probably most often missed by birders. After some high fives, we settled in for more waiting and were soon rewarded by a Zapata Sparrow moving across the opening, another very local and rare specialty of the swamp. The other area endemic, Zapata Rail, is now very rare, essentially impossible to see, and its voice unknown with claimed recordings now considered to be Spotted Rails. The remainder of the afternoon we explored the swamp, adding Ruddy Quail-Dove to the Columbid list and seeing other more widespread species. After checking several locations, we finally found late afternoon a small group of the endemic Red-shouldered Blackbird, similar to the more widespread Tawny-shouldered Blackbird, but with flaming red epaulets. After a hot but completely successful day in the Zapata Swamp, we returned to our casa for the difficult nightly choices of mohito or daiquiri and papaya, mango, or pineapple and lobster, fish, or shrimp. Life is tough. April 20 was mostly a travel day, so we lingered around the casa in the morning. 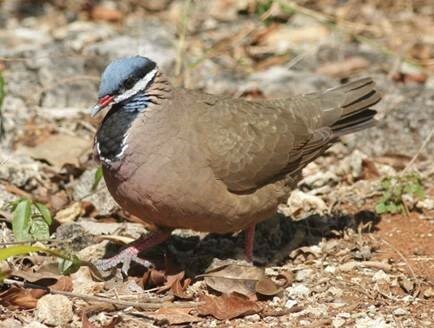 By the time we arrived the private reserve Bermejas, the forest had become relatively quiet and the quail-doves the reserve is known for had slipped into the forest. 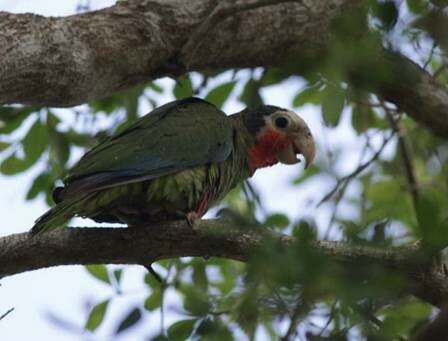 We did see and hear several Great Lizard Cuckoos, Cuban Trogons, Cuban Todies, and our first flock of Cuban Parakeets. The caretaker led us to a flowering hedge where two Bee Hummingbirds were feeding along with several Cuban Emeralds. We then drove on a few more hours to our beach resort hotel outside the old city of Trinidad on the south coast. Resort hotels, catering mostly to Europeans and Canadians, are owned and managed by the government, and all inclusive with unlimited food, bars, and you guessed it human nightlife. On April 21, we departed mid-morning for our longish drive east in the Cuban interior to the hill country around Camaguey. The drive was made longer by a stop to replace a burst hose in the bus in the middle of nowhere, which Raul accomplished with a phone call, delivery of a new hose within an hour, and a few tools. Fortunately, the hose decided to burst near a roadside bar, and we enjoyed some casual birding a beer while Raul took care of the bus. This region is known for the rare and local and endemic Gundlach's Hawk and I had been constantly scanning for any hawks, picking up a few Red-tailed Hawks and Kestrels. A hawk rose above a distant hill with the characteristic flap-glide of an accipiter, and we all got on our first Gundlach's Hawk, albeit a distant view before it disappeared behind the hills. Our destination was a region of large ranches, and we would stay at the ranch turned resort Finca la Belen. We only had an hour or so of birding time after arrival, but managed to find the local targets Palm Crow with the more abundant Cuban Crow and Plain Pigeon, along with several Cuban Parrots and Cuban Parakeets. The next morning April 22, we walked along a road through the ranch, where we had another pair of Giant Kingbirds at a nest. 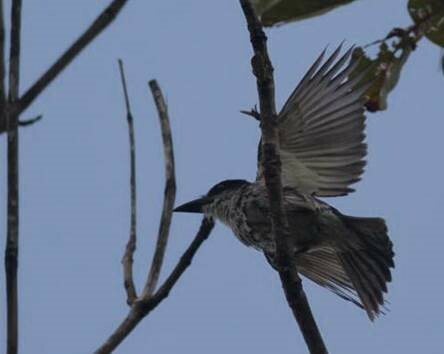 This is the best area in Cuba for Giant Kingbird, which we had been lucky to see at the start of the trip at La Guira. We continued on to the north coast and Cayo Coco, a coastal island reached by crossing a long causeway and the beach resort center of Cuba. 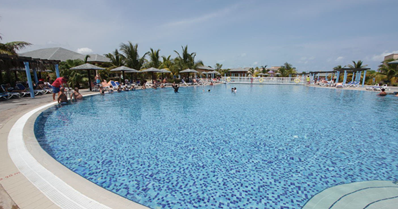 Several large, all-inclusive resorts are clustered along the white beaches and blue Caribbean. We stayed at the Pestana. First thing the next morning April 23, we were greeted by Paulino, arriving in his white 1954 Chevy BelAir. In a full day, extending into dark for some, we visited all the interesting birding sites and found and photographed all the local specialties. 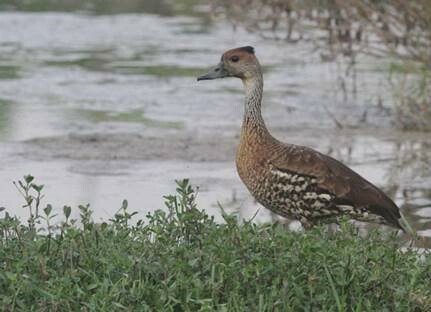 We started at one of those classic birding spots, the local sewage treatment plant, where several West Indian Whistling Ducks joined Black-necked Stilts, Common Gallinules, and assorted waders on a wood fringed pond. 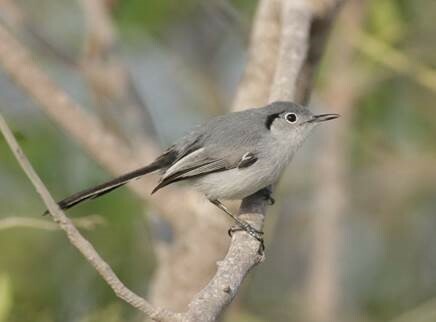 Driving on to Cayo Guillermo to the west we quickly found the targets Cuban Gnatcatcher and Bahama Mockingbird in the coastal scrub. Next was Cuevos de los Jabalis, a limestone outcrop tucked in some forest, where Paulino had set up a water drip and the caretaker threw out occasional handfuls of rice. 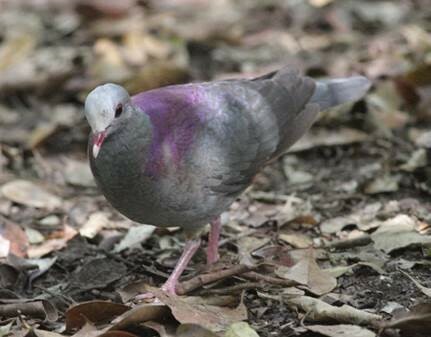 We had our first Oriente Warbler and nine Key West Quail-Doves, completing the full list of Cuban columbids. After lunch back at Pestana, we drove on to Cayo Paredon Grande to the east, with periodic stops for an even closer flock of roadside flamingoes to photograph. This is a beautiful and largely undeveloped coastal area blanketed with the very local stunted silver palm, but under significant resort development pressure according to Paulino. 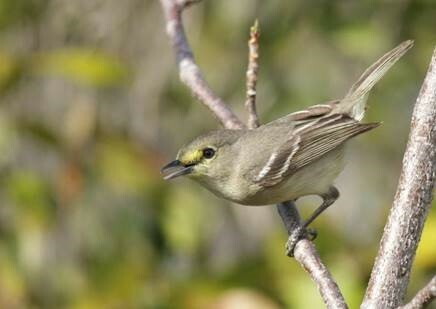 It is the best location for Thick-billed Vireo, and we found several in short order. After returning to the hotel, a few of us had the energy to try for the difficult Cuban Nightjar. At the closed old airport as darkness set in, we heard a nightjar call in the distance. After a short walk, we had one in a light flying around and perched on a limb. The end of a full and rewarding day. On April 24, we departed after breakfast for the long drive to Havana. Paulino told me Gundlach's Hawk had been reported around a hotel near the town of Santa Clara, and Raul knew the hotel so we decided to give it a try. Workers at the hotel were aware of the hawks, and led us to the back of the property where a Gundlach's Hawk was quietly sitting on a nest in a tall pine. 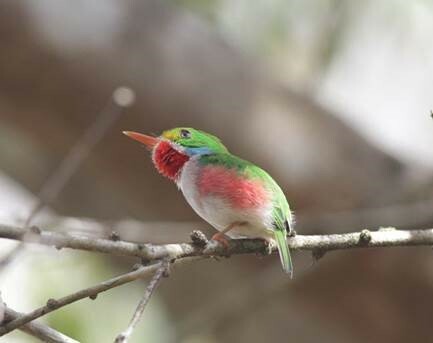 How easy was that for one of the most difficult birds in Cuba. 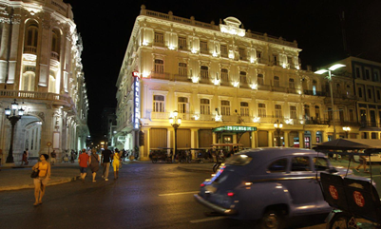 We continued on, arriving in Havana late afternoon and checking in to our classic old hotel in the heart of Old Havana, the Inglaterra. We had time to explore the area, and a great final Cuban dinner at a nearby restaurant. After dinner some of us visited Floridita and Bodeguita del Medio down the street. 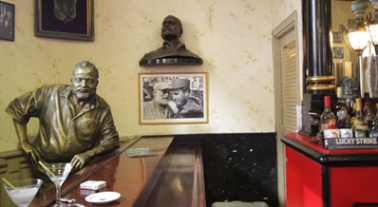 A framed paper above the bar signed by a somewhat famous writer who lived in Havana for several years, Ernest Hemingway, says “My mojito in the Bodeguito del Medio and my daiquiri in the Floridita.” Always seeking to improve my writing skills, I had to try both. Cuba is a great place to visit. The people are friendly and welcoming, especially the young people, and curious about Americans who are starting to appear with the eased travel restrictions. 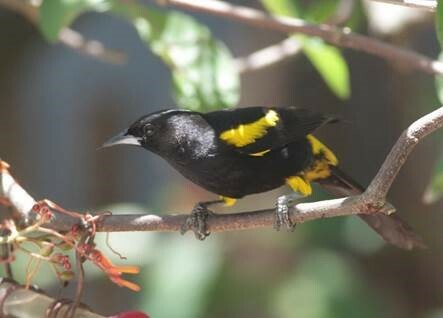 The birding is the best in the Caribbean, edging out Jamaica in my assessment. I hope it is prepared for the influx, as travel restrictions on US citizens is likely to ease further. My advice: if you are interested in Cuba, go as soon as you can before things change.